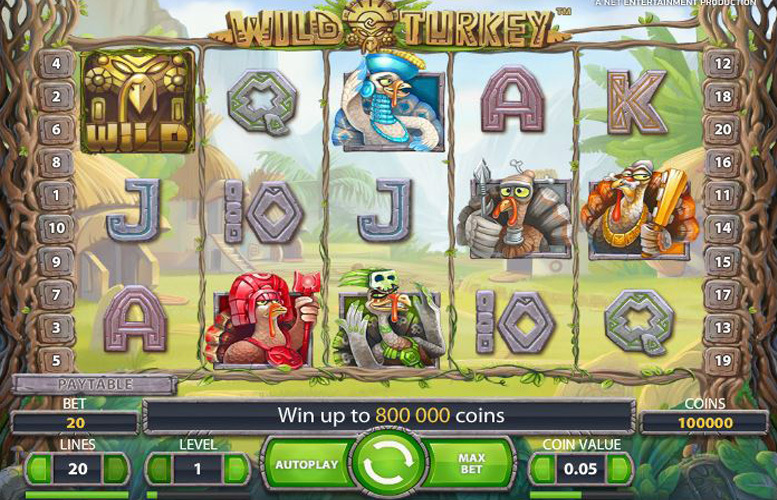 Boasting some fun poultry related symbols, Wild Turkey is a five reel and three row slot with a choice of anywhere between one and 20 paylines and a theoretical return to player percentage of 96.6%. Allowing players to set their own bet level and coin value per spin, the slot also offers wild substitutions, free spins and stacked wilds during free spins to increase winning potential. 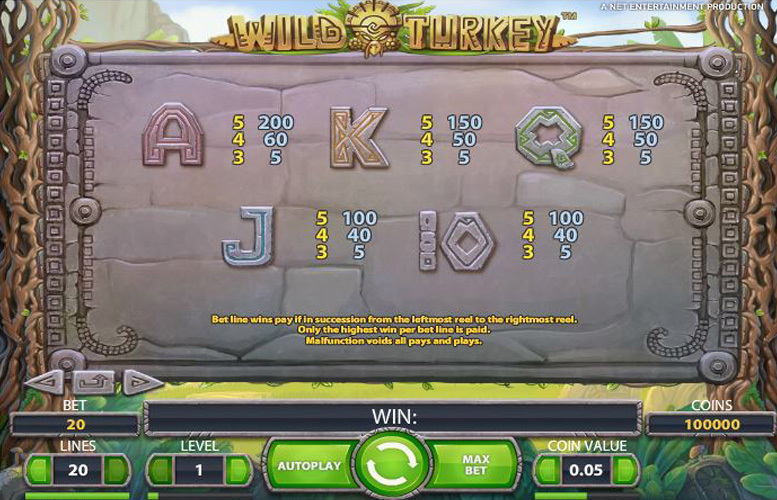 A comparatively simple slot game, Wild Turkey only has a handful of special symbols and features. These will all be explained as part of our full review, along with the game’s top jackpot, paytable information and betting limits. Coin wins in Wild Turkey are achieved when combinations made up of three symbols or more line up from left to right along an active payline. The most valuable combinations are those made up of five symbols and the most valuable symbol of all is the red turkey symbol. Five red turkey symbols in combination along an active payline return a coin win worth 4000 times the current bet level. That means that at the highest possible bet level of ten, the maximum payline jackpot equals 40,000 coins. With all 20 paylines active, therefore, and if the red turkey symbol takes up every space on the reels a maximum overall jackpot of 800,000 coins (40,000 x 20 paylines) will result. At the highest possible coin value of 50p, that maximum jackpot would be worth £400,000 to the player. Wild Turkey is a slot which actually only has one special symbol but it does serve two distinct purposes within the game. That symbol is the slot’s Wild and as well as substituting for all other symbols to make up the most valuable combination possible, it also serves to activate the game’s free spins. Wild Symbol – three or more Wilds appearing anywhere on the reels trigger those free spins according to the game’s paytable and the spins are played with the same paylines and at the same bet level and coin values as the spin which activated them. 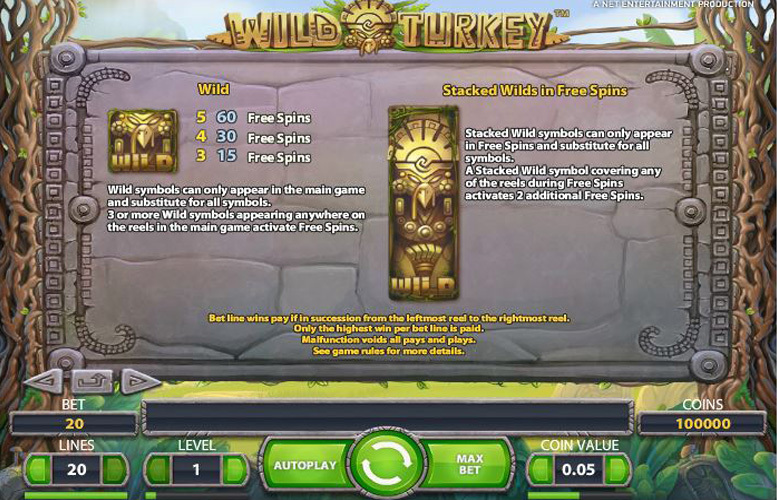 Free spins are generally the same as normal Wild Turkey spins, except that Wild symbols during free spins can be single, double stacked or triple stacked wilds. If a three symbol stacked wild does appear and covers an entire reel, it serves to activate two further free spins in addition to those already ongoing. It is full five symbol combinations which are most valuable to Wild Turkey players and the highest paying symbol of all is the red turkey symbol. A combination of five of those symbols across an active payline is worth 4000 times the bet level, so at the highest bet level of ten results in a payout of 40,000 coins. If the same combination were to appear across all 20 paylines at once, and all of those paylines were active, the game’s ultimate top jackpot of 800,000 coins (40,000 x 20) would be won. After the Red Turkey symbol, the next most valuable is the orange turkey and a combination of five of those symbols is worth 2000 times the bet level. That means that the overall top payout for that symbol (if it were to appear on all spaces of the reels) is a total of 400,000 coins. 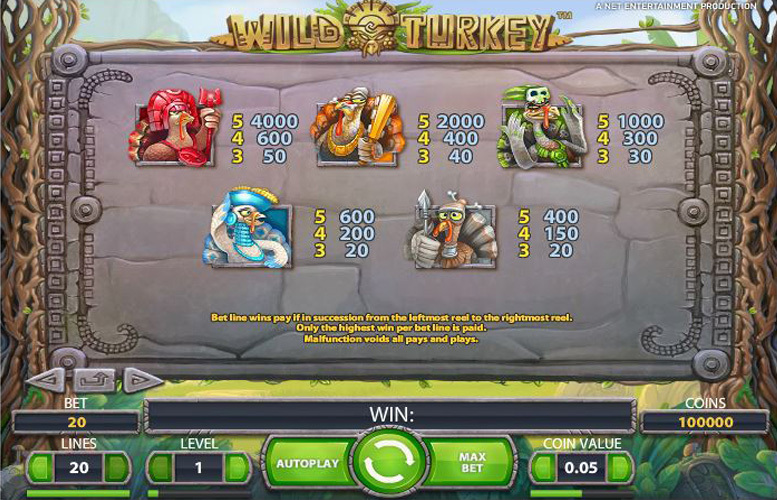 Wild Turkey players can alter the amount that they stake per spin during the game in three distinct ways. Firstly, they can choose to have anywhere between one and 20 paylines active for the spin. Secondly, they can choose how many coins to bet per payline by selecting a bet level from one to ten and finally, they can also determine how much each coin is worth by setting the coin value. That means that a player can choose to bet a minimum of just 1p per spin if they set all of those three variables to their lowest possible marks. Alternatively, they can stake a maximum of £100 if they choose the maximum possible options for each of the three. Players looking for a slot game that is really easy to understand and which returns potentially life changing jackpots will likely love Wild Turkey. A traditional five reel and three row slot, the game is one which any occasional slots player will be able to open and begin playing immediately without any need to check on game rules or the paytable. What’s more, if the player were to select the maximum possible payline, bet level and coin value settings, the game can return an astonishingly generous top jackpot worth £400,000. That is an impressive payout by all measures and outstrips those offered by the vast majority of other slots games on the market. A criticism which can be levelled at Wild Turkey, however, is that it is a game which might get quite boring quite quickly. Gameplay has few special features and no real extra games or elements other than free spins, and that means that it is far simpler and less immersive than some slots. This game has a rating of 8 / 5 with 703 total reviews by the users.